The terminal block market size is estimated to grow from USD 3.21 Billion in 2015 to USD 4.64 Billion by 2022, at an estimated CAGR of 5.5% between 2016 and 2022. The report aims at estimating the market size and future growth potential of the terminal block market across different segments such as type, industry, and region. The base year considered for the study is 2015 and the market size is estimated from 2016 to 2022. The growth of the market would be primarily driven by factors such as growing PCB market and increasing demand for PCB terminal blocks; advancements in various connection technologies for terminal blocks; rising demand for multipurpose, multifunctional, intelligent, finger-safe terminal blocks; increasing adoption of terminal blocks in the telecom sector. 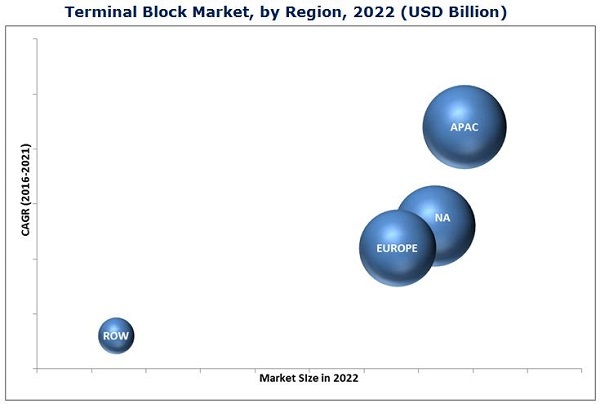 The terminal block market comprises manufacturers such as PHOENIX CONTACT GmbH & Co. KG (Germany), Weidmüuller Interface GmbH & Co. KG (Germany), WAGO Kontakttechnik GmbH & Co. KG (Germany), Wieland Electric GmbH (Germany), ABB Group (Switzerland), Rockwell Automation, Inc. (U.S.), WECO Electrical Connectors Inc. (Canada), Eaton Corp. Plc (Ireland), Molex, LLC (U.S.), METZ CONNECT (Germany), and so on. According to the MarketsandMarkets forecast, the terminal block market size is estimated to grow from USD 3.21 Billion in 2015 to USD 4.64 Billion by 2022, at an estimated CAGR of 5.5% between 2016 and 2022. The growth of the market is primarily driven by factors such as increasing demand for terminal blocks in the telecom sector; advancements in different connection technologies of terminal blocks make it a preferred choice in various industries such as industry controls, HVAC, telecom equipment, and so on; increasing adoption of multipurpose, multifunctional, intelligent finger-safe terminal blocks; growing demand for PCBs, and thereby PCB terminal blocks. The report covers the terminal block market on the basis of its types and industries. The market is further segmented on the basis of regions into North America, Europe, APAC, and RoW. Sectional terminal blocks dominate the market and the same is expected till 2022. Overview of the terminal blocks based on structure, function, and connection has been provided. Advancements in connection technologies such as spring clamp, screw clamp, insulation displacement connection, push-in terminals, special connection tehcnologies such as slip-on connection and TERMI-POINT conenction offer various advantages for different types of connections in the industries such as industry controls, instruments, power supplies, HVAC, telecom equipment, automotive and transportation, and so on. It helps to derive the demands for terminal blocks. The market for PCB terminal blocks is expected to grow at a significant rate in the coming years. Growing demand for 3C applications (communication, computer/peripheral, and consumer electronics); advancements in PCB technologies; and increased demand for aerospace and defense products; advancements in smartphones, touch screen tablets, laptops; and increasing demand for consumer electronics are expected to spur the PCBs market in the coming years which consequently increases the demand for PCB blocks. APAC is expected to grow at the highest CAGR in the terminal block market between 2016 and 2022. Increased industrial activities in China, India, South Korea, Indonesia expected to drive the terminal block market in the APAC region in the coming years. Cyclic nature of some industries such as automobile, consumer good, machinery, and tooling restrain the market growth. However, the rapid urbanization and industrialization in developing countries and rising demand for micro-miniaturized terminal blocks provide opportunities for the growth of this market. The major vendors in the terminal block market include PHOENIX CONTACT GmbH & Co. KG (Germany), Weidmüller Interface GmbH & Co. KG (Germany), WAGO Kontakttechnik GmbH & Co. KG (Germany), Wieland Electric GmbH (Germany), ABB Group (Switzerland), Rockwell Automation, Inc. (U.S.), WECO Electrical Connectors Inc. (Canada), Eaton Corp. Plc (Ireland), Molex, LLC (U.S.), METZ CONNECT (Germany), and so on. These players adopted various strategies such as new product developments, mergers, partnerships, collaborations, and business expansions to cater to the needs of the terminal block market. 12.8 Weco Electrical Connectors Inc.